In a latest development it was revealed that Reliance Jio users would be able to make voice calls using any other rival networks too. Yes, you read that right. RJio subscribers would be able to use any network for dialing any number, but using their own mobile number. This would be made possible by Reliance Jio’s mobile app called ‘Jio Join’. Once set up, the app would re-route the calls that you would make using the internet to the recipient’s phone. We saw a lot of hue and cry from leading telecom operators last year, when WhatsApp introduced voice calling. Note that WhatsApp VoIP services only let the users talk to anyone across the globe with the condition that the other party must also be online on WhatsApp mobile app. However, Reliance Jio’s Jio Join app would also allow users to talk to anyone across the globe whether or not they are using Jio Join app. So it is more likely to generate a lot of unrest in the telecom industry in India post Reliance Jio launch. We are also expecting the rival telecom operators to come up with similar offerings to counter RJio. 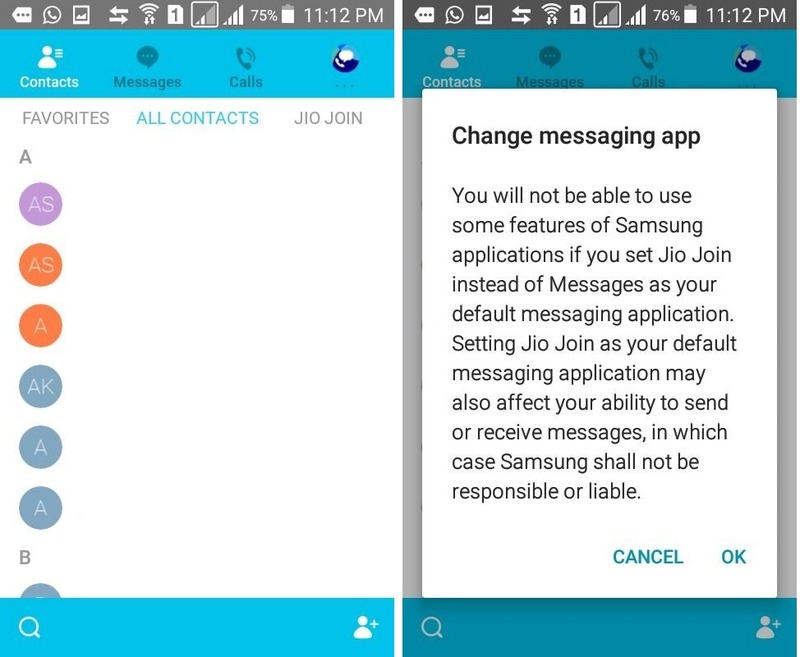 How ‘Jio Join’ App Lets You Call Anyone Using Internet? Indian regulations currently prohibits all OTT players to let users call anyone on their mobile phone or landline telephone using the internet. That’s why you can only call people using Skype or WhatsApp only when they are using the same app. The call quality will depend on the internet connection of both the parties. A poor connection at just one end can spoil the call clarity and the overall experience. But this is not true in case of Jio Join. To call any number (mobile or landline) using Jio Join, only the caller needs to have a good internet connectivity as other party doesn’t need to have internet access to make the call possible. The inverse of this is also true. Reliance Jio users on the Jio Join would be able to receive voice calls/SMS (over Wi-Fi) on their phone even if they don’t have any network coverage. In this case also, only one party (i.e. the caller) needs to have cellular coverage. Reliance Jio can do so and other OTT players like Sykpe, WhatsApp, Viber, etc. can’t because Reliance Jio has a telecom licence. All of this has been made possible by VoLTE technology. The subscribers need to have a 4G phone supporting VoLTE to be able to use this feature. With VoLTE you will never be out of network coverage as long as you are connected to any Wi-Fi network. However, it must be noted that unlike WhatsApp and Skype VoIP calls, calls made through Jio Join using VoLTE won’t be free. You would only be able to make free calls when both the parties are online and using Jio Join app. Reliance Jio would charge you something close to 14-20 paise per minute for making such calls. RJio would have to pay other operators 14p/min to let its subscribers call anyone on other networks using Jio Join app. This is still very affordable when compared to the current voice call tariff (50p/min approx.). Leading networks like Airtel, Vodafone, Idea, Aircel, and BSNL need to worry as this feature from RJio has potential to severely tamper their Voice call revenue. Only the perceived call clarity can make this feature a hit or a flop show. VoIP apps that let the users make free voice calls couldn’t take off in India because of poor voice clarity. But we know that VoLTE provides much better call clarity, theoretically. So we have high hopes from Reliance Jio’s VoLTE implementation. "Reliance Jio Subscribers Can Make Voice Calls Through Airtel, Vodafone, and Idea As Well! ", 5 out of 5 based on 8 ratings. Can you please update the post with the link of the Jio Join app on Playstore as I was unable to find it there.